Amir Khan 31-4 (19) has admitted that he took the fight against Canelo Alvarez two years ago out of desperation after big-ticket fights with Floyd Mayweather and Manny Pacquiao failed to materialise. 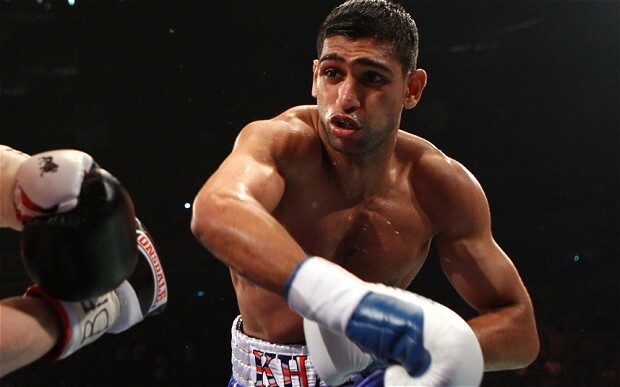 Speaking on the Sky Sports documentary Amir Khan: Off Limits, he said: “There’s fights I’ve wanted, like for example the Floyd Mayweather fight – that was talked about for years and years, and didn’t happen. The Manny Pacquiao fight, which was talked about and didn’t happen, so you do kind of fall out of love [with boxing]. “The reason I took the ‘Canelo’ fight is because I got quite desperate. “I really wanted a big super fight and I wanted my name up on the Vegas strip. It’s always been my dream. The fight against Alvarez 49-1-2 (34) ended badly for the 31-year-old Bolton boxer, who was knocked unconscious is the sixth round by a right hand bomb that detonated on his jaw. Still, Khan is pragmatic about the fight. “I’ve been knocked out before and I’ve come back from it, winning world titles,” said Khan. “The mistake I made in there was my own fault. I dropped my left hand and I got caught over the top with Canelo’s right hand. “I would rather be knocked out with one big shot instead of taking numerous punches and getting stopped that way, so I’m glad it was just that one shot. “Should I have taken that fight? Maybe not. It was a massive opportunity for me. I don’t regret it, no. “If I never took that fight I would have always thought ‘what would have happened?’ He beat me that night. He was the better fighter that night. “My hand was always bad. I was quite scared to get it operated on. Last year Khan made a play to get Pacquiao in the ring that fell apart when the multi-million dollar backing from the Middle Eastern investor turned out to be nothing more than a desert mirage. Khan will face Canadian welterweight Phil Lo Greco 28-3 (15) this Saturday at Echo Arena in Liverpool, England.